The Gromits’ are in town. All eighty of them! Launched by Wallace & Gromit’s Grand Appeal and Aardman Animations, Wallace’s canine sidekick is dotted around the City of Bristol having each been decorated by invited artists, which include such prestigious names as Sir Paul Smith, Cath Kidston and er, Harry Hill. I’m sure every freelance photographer in the City has taken a commission to photograph one or all of these fabulous, fun sculptures. I was tasked to photograph the 'New Found Land' Gromit painted by One Red Shoe and sponsored by Yankee Candle. Easy task? An inanimate giant plaster dog, what can go wrong? Well I have learnt over the last fifteen years, never to utter those words. There are always pitfalls and problems to solve. If you approach a job with anything other than one hundred percent commitment you run the risk of failing to maximize it’s potential to deliver the quality image that is needed and expected by the client. New Found Land Gromit is bolted to the deck of the Matthew. 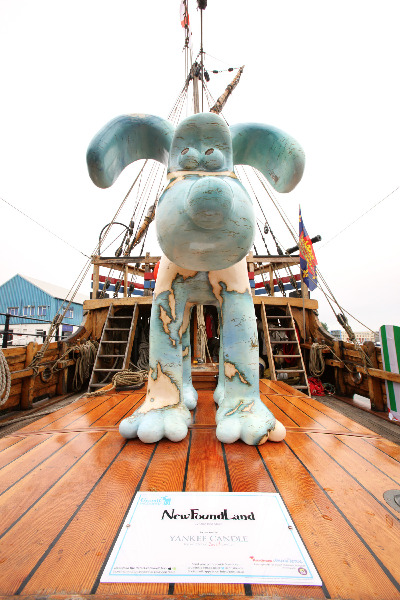 A full-size replica of the vessel sailed by John Cabot in 1497 from Bristol to North America, hence the name of the Gromit on board as Cabot made landfall at New Foundland although the precise location is not known. What the sponsors Yankee Candle wanted was an image of the Matthew sailing out on it’s maiden voyage with the Gromit onboard under the Clifton Suspension Bridge, three Bristol Icons for the price of one. Preparations to sail were under way and when I asked what time they ‘Cast-off’ I was politely informed that you ‘Let Go’ and the former term has more to do with knitting than the nautical. So off I set and scouted various locations just to make sure I had the best one for the purpose. I then took position looking down the Avon Gorge and waited for the high tide and the appearance of the Matthew through the swing bridge and out of the Cumberland Basin. I waited, and waited still nothing, time to check with my contact on board. An unbelievably freak event had occurred…… The Swing Bridge, which has to open to let this masted ship out of the Floating Harbour, had malfunctioned and the whole trip was effectively off. It’s funny but even in such moments when fate intervenes and what your required to do just isn’t going to happen as a professional and wanting to get the best for your clients and for yourself you instantly try to think of alternatives to get a shot, any shot that the can be used but I already had that in the bag and unfortunately until the next sailing of the Matthew and Gromit, decorated with the route of the Matthew’s famous voyage, I just had to ‘Let Go’ and accept that sometimes things are completely out of your control, but not always, especially when you have foresight and experience to draw on.